ASL Safaris representative will pick you from the airport and take you to the hotel you will reside in Kampala. If you arrive in the morning, its better you change your money to Ugandan currency. ASL provides you with a trained guide or driver who will help you to visit some exciting places in Kampala. These include; Kasubi Tombs, Namugongo Martyrs Shrine, the Uganda museum among others .Dinner and overnight at Serena Hotel, Speke Hotel Kampala or Hotel Africana. 2nd Day: Drive To Kibale Forest National Park. Have breakfast, then after go to Kibale via Mubende. Go with packed lunch because you will arrive late afternoon and take a walk on Bigodi swamp in search for different bird species like the White-winged Warbler, Papyrus Gonolek and many more plus different fauna species. Dinner and overnight at Luxury-Ndali safari lodge Uganda in Fort portal, Mid range- Rwenzori View Guest House/Basic- Kanyankyu ecological site. 3rd Day: Kibale Forest National Park. 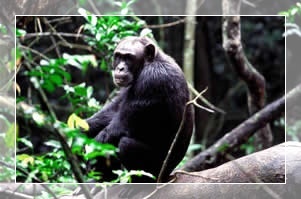 Kibale Forest national park is commonly known for a superlative diversity and highest massing of primates in the Great Lakes region. In Kibale, we shall take a nature walk in the tropical rainforest, with the help of trained guides; we will search for the wild chimpanzees. Have lunch in the afternoon and continue to Queen Elizabeth National Park through the crater lakes region which has over 30 crater lakes for exploration. This area has a ravishing and luring terrain. Dinner and over night at Luxury -Mweya Safari Lodge / Jacana Safari Lodge/Lake kitandara camp/Budget- institute of Ecology depending on what you are comfortable with. 5th Day: Queen Elizabeth National Park - To Lake Bunyonyi. Have breakfast, take a short drive to Kyambura gorge and take a walk in the gorge and Kyambura River where the game reserve derives its name. 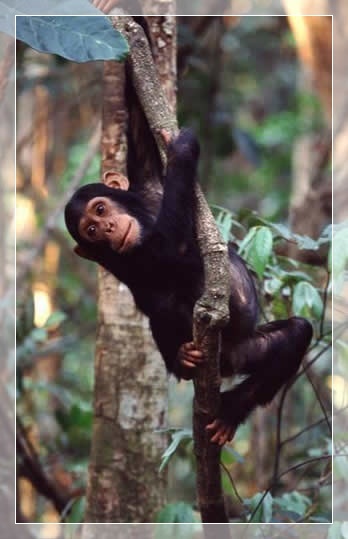 On this point you should be expectant to view various primates most especially different species of Chimpanzee, Black and white Colobus monkeys and other animals like hyenas, antelopes, Lions and many others found in the middle of savanna grassland. This gorge is accommodates a big number of bird species. Have lunch en route then you will be taken to Lake Bunyonyi for another scenario, arrive in time for evening birding. Dinner and overnight at Acadia Cottages, or Lake Bunyonyi Overland Camp. Boat ride on Lake Bunyonyi in dug out canoes will be made, then after lunch depending on your preference; you can take leisure walks, mountain biking or swim, sun-bathe according to your desires. Dinner and Overnight at Acadia Cottages or Bushara Island Camp or Lake Bunyonyi Overland Camp. 7th Day: Transfer To Bwindi Impenetrable Forest National Park. You can take an evening walk for Buhoma Village at an extra $15.usd per person OR relax enjoying the evening till dinner and overnight. 8th Day: Bwindi Impenetrable Forest National Park. 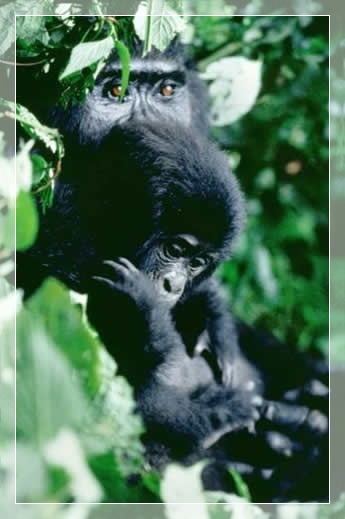 Go for the long awaited adventure of Gorilla tracking in the Bwindi Impenetrable forest. Gorilla tracking is unpredictable, as it is difficult to estimate how long it may take you through the jungle; though the excursion may take 2-8 hours. It all depends on the movement of these great apes. "The excitement of seeing the gorillas makes it all worthwhile!" is what anyone who has made the tracking will be enhanced to say in any circumstances. Dinner and Overnight at Lake kitandara luxury tented accommodation or Basic - Buhoma community bandas. 9th Day: To Lake Mburo National Park. Have breakfast, then after we drive to Lake Mburo National Park. At Mburo, we shall have an evening game drive searching for; Buffaloes, Topes, Water buck and not forgetting the Eland, (the largest of the Antelopes found in Uganda). Dinner and Overnight at; Luxury- Mantana Luxury Tented Camp or you can drive to Mbarara and sleep at Agip Motel or basic at Rwonyo rest camp at the park headquarters. 10th Day: Lake Mburo National Park. In the morning, take a game drive in the park and later return to your hotel for late breakfast. After breakfast, you can do boat riding on Lake Mburo. Leave for Kampala in the afternoon. You can take a stop over at the Uganda Equator for some shots and visit to the Craft Village. After the driver/guide will drop you at your hotel in Kampala for over night. 11th Day: Kampala City Tour. Have breakfast, after which you will take a trip to Uganda's capital city. The trip starts in the morning at 08:30 am. This tour will take you within the greenest city in Africa. Pay a visit to the Bahai temple which is the biggest and only religious temple building of its kind in Africa. This temple is a good site for picnic due to its beautiful picnic scenery rightly placed on a hill that gives you a view of the city. The Uganda Museum, centre for historical features with lots of colonial, cultural and traditional collections, you can also pass via the Makerere University the first and the oldest university in East Africa. Kasubi tombs - The largest crypt in Africa and special burial place for Uganda kings. ASL Safaris provides you with a guide that will be give you all the necessary information and interesting history on whatever you will see. Namirembe Cathedral which is the first and oldest religious feature that was constructed by the European missionaries. Go for Lunch at the African Village Restaurant. Continue to Namugongo Shrines a historical place where the first Ugandan Christians were burnt to death by the orders of a Buganda king. They are known as the Uganda martyrs and their death is celebrated yearly on the 3rd of June. Pass by the Ugandan craft village –buy souvenir like the African art, curving, and masks of your desire. Go back to your Hotel for Dinner and overnight. 12th Day: Departure From Entebbe International Airport. Have an expedition before the Airport transfer. You can do some shopping for souvenir. Prepare yourself and get ready for the 40 minutes ride to the Airport, Check in before time of the flight and the ASL representative will glad to wish you the best and will be greateful to have you back in Uganda some other time! Then the representative will be off. Note that we have two types of Safaris, Luxury Safari (lodges / hotels) and Budget Safaris (camping and simple accommodation). Our rates vary with the accommodation type, nevertheless the rest of the activities will remain the same. Feel free to inquire.